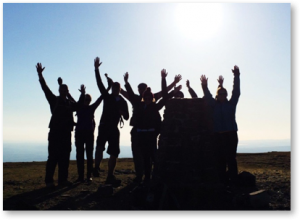 We are now taking enquiries for the Three Peaks Challenge 2018. Why not do something different in 2018? Climbing the 3 highest mountains in Scotland, England & Wales within 24 hours is certainly a memorable challenge. The Three Peaks Challenge is definitely not to be underestimated and is a real test of endurance and stamina. The Three Peaks is a unique and memorable challenge where you will have to dig deep and keep on going. All travel arrangements and pick ups are flexible within reason. We can also provide a pick up service en route from North Wales to Fort William if you live along the way. Please contact us for details. We travel up from Snowdonia to Fort William, where you can join us in the minibus or you can fly to Glasgow on Saturday morning where you will be met by your leader and taken to the start of the challenge. All travel arrangements and pick ups are flexible within reason. We can also provide a pick up service en route from North Wales to Fort William if you live along the way. Please contact us for details. The challenge starts on Saturday climbing Ben Nevis (1344m) the highest mountain in the UK. Once on the summit you will be rewarded with breathtaking views of the Scottish Highlands before making your descent back to the minibus and starting the overnight journey to the Lake District. Scafell Pike (978m), the highest mountain in England is next and head torches are needed here as the climb takes place during the night with the aim of reaching the summit for sunrise. The final challenge takes on the highest mountain in Wales, Snowdon (1085m). Once on the summit there will be time for a quick photo before making the descent down to Llanberis. Upon completion of your challenge you will be transferred to your accommodation for a night of celebration and rest. Light Breakfast before Scafell Pike. The first peak, Ben Nevis, is the highest mountain in the UK, standing at 1,344m, with spectacular views as you trek into the sunset, it is a stunning way to start the challenge. The trek begins on the main path from Glen Nevis. The path was originally built to service a meteorological observatory of which the remains still stand at the summit. The walk to the summit takes approximately 2.5hrs and involves 1,370m of ascent. On summiting you will have the chance to enjoy the breathtaking views of the Scottish Highlands. Our descent should take approximately 2.5hrs. Once back in Glen Nevis you’ll have time for a short break and light meal, before jumping on the minibus for some rest and sleep, as we drive through the night towards the Lake District. We will have a short break on route to pick up some snacks and re-fuel. The transfer time from Fort William to Scafell Pike takes approximately 6hrs, arriving at Wasdale Head in the early hours, there will time for a hot drink and a light breakfast before starting ascent of England’s highest mountain. Our second summit of the 3 peaks challenge, Scafell Pike, is the highest mountain in England standing at 978m. The ascent begins from Wasdale Head, a tranquil part of the Lake District, also known as the birth place of British climbing. The challenge here is trekking by the light of head touches. Arriving at Snowdon around 1pm, Our final challenge takes on the highest mountain in Wales, Snowdon or Yr Wyddfa in Welsh, standing at 1085m. Snowdonia is unique for its bio-diversity of plants and wildlife and with breath taking views from the summit is a great end to the last of your 3 peaks.Our ascent route will be on the Pyg track which rewards us with those classic Snowdon views. The ascent should take approximately 2hrs.Once on the summit we will have time for a photo and enjoy the views before starting our decent down either the Llanberis path or the Pyg Track. The descent should take approximately 2hrs. Arriving at our hotel for a night of celebration.Upon completion of your challenge if you need to travel home we can arrange a transfer to Bangor or Chester which has good rail links to all parts of U.K. We can also arrange a private coach transfer for the group either on Sunday or Monday after completing your challenge.Please note timings are approximate and depend greatly on the group. All times are set trying avoid walking in dark as this will slow the group down, especially in poor weather, with large groups we find that the best option is start your 24hrs at the base of Ben Nevis and finish your 24hrs on the summit of Snowdon, this does not mean that fast groups cannot reach the base of Snowdon within the 24hr period. Our accommodation will be based in Llanberis at the base of Snowdon. Training and a good level of mountain walking fitness is definitely required, this is not for the faint-hearted.This is a tough challenge and physically and mentally draining, sleep deprivation plays a part here, affecting some people more than others, particularly with awkward sleeping conditions. As much preparation and training you put in beforehand the better chance of success you have. The easiest way to book your 3 Peaks Challenge is online via the website, You will need to pay a non-refundable deposit of £75.00 at the time of booking.